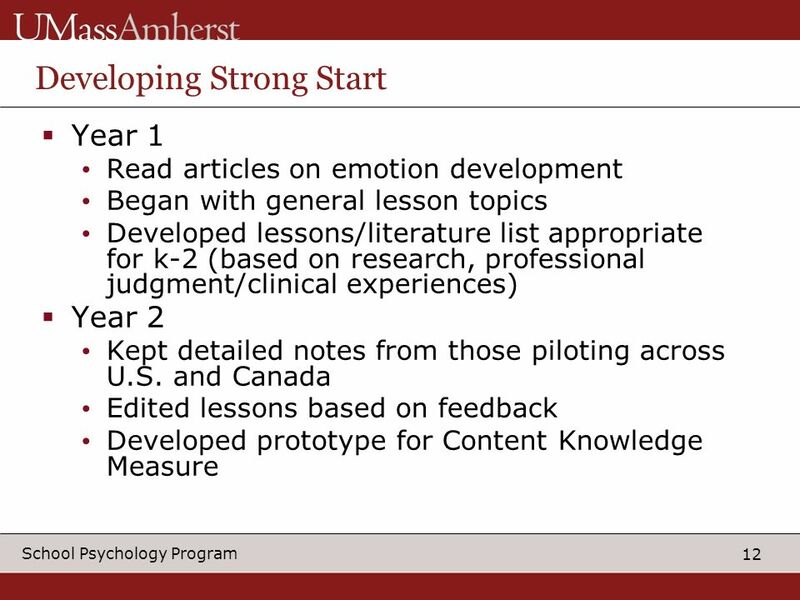 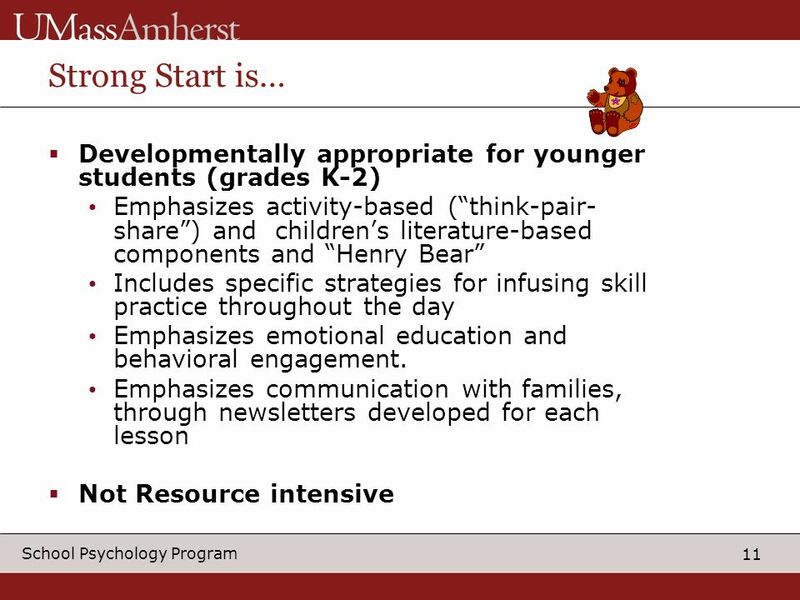 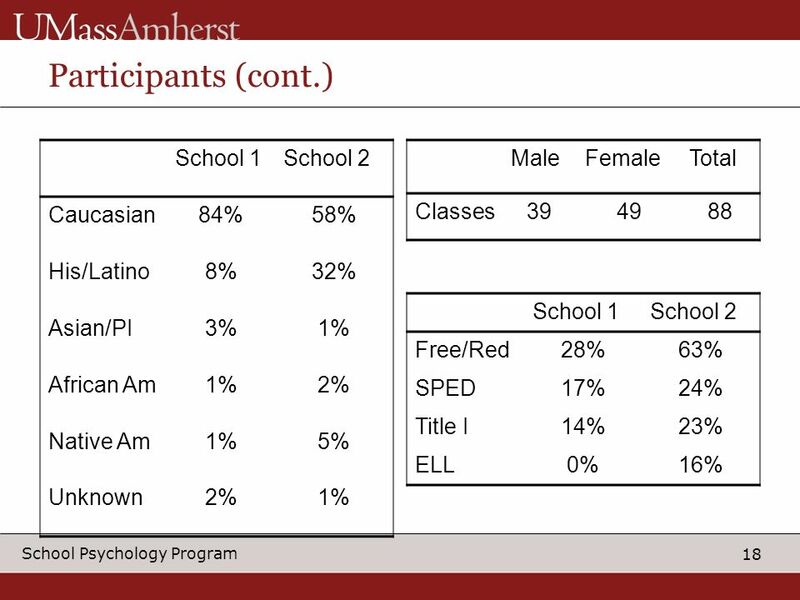 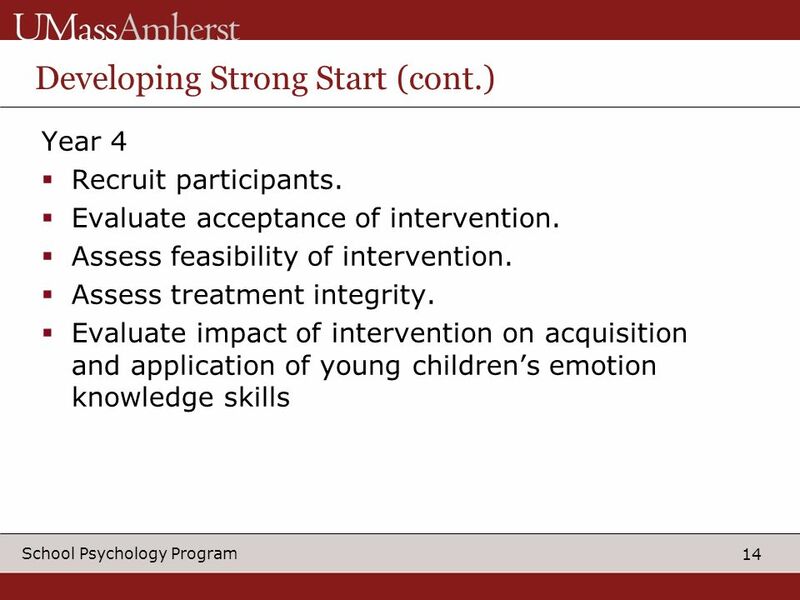 School Psychology Program A Preliminary Study of the Strong Start SEL Curriculum Sara Whitcomb, Ph.D. University of Massachusetts Presented at the Annual. 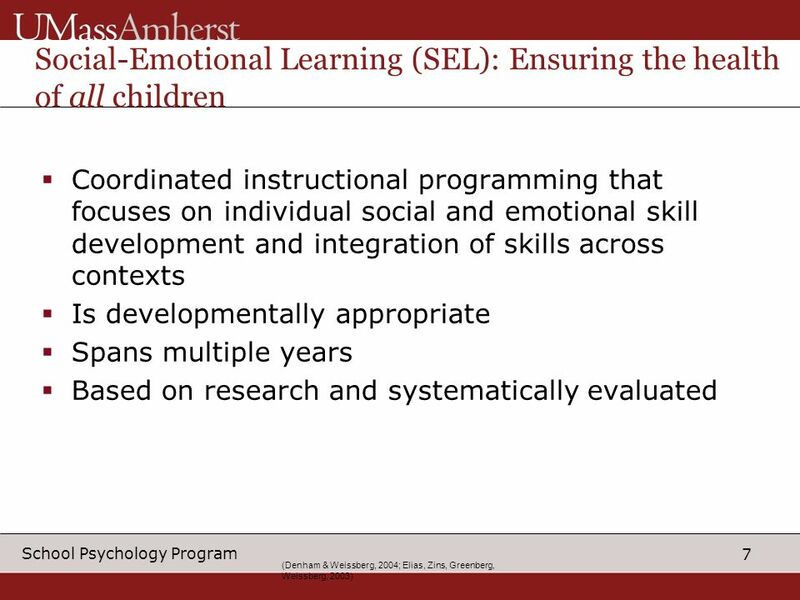 5 5 School Psychology Program (Coie, Miller-Jackson, Bagwell 2000; Merrell 2001; Rimm- Kaufman, Pianta, & Cox, 2000; Roeser & Eccles, 2000) The Problem 12-22% of school-aged children with social- emotional difficulties significant enough to require services. 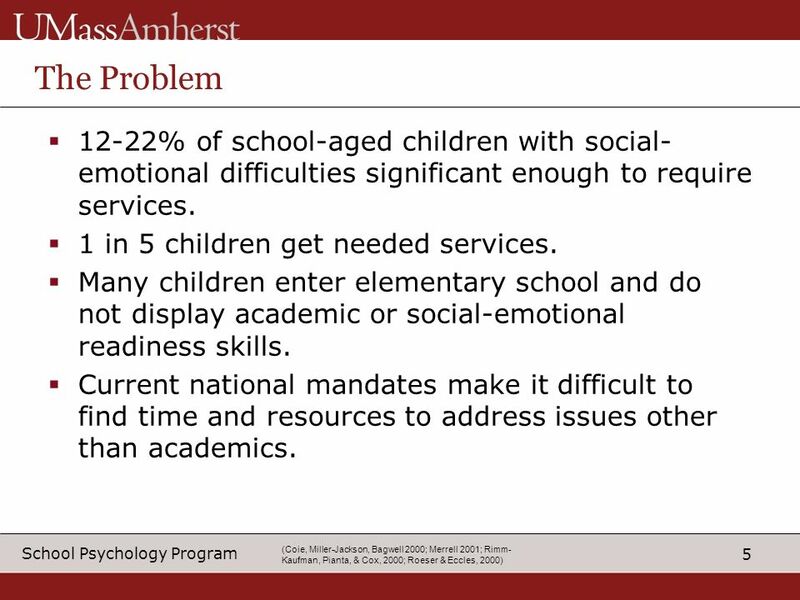 1 in 5 children get needed services. 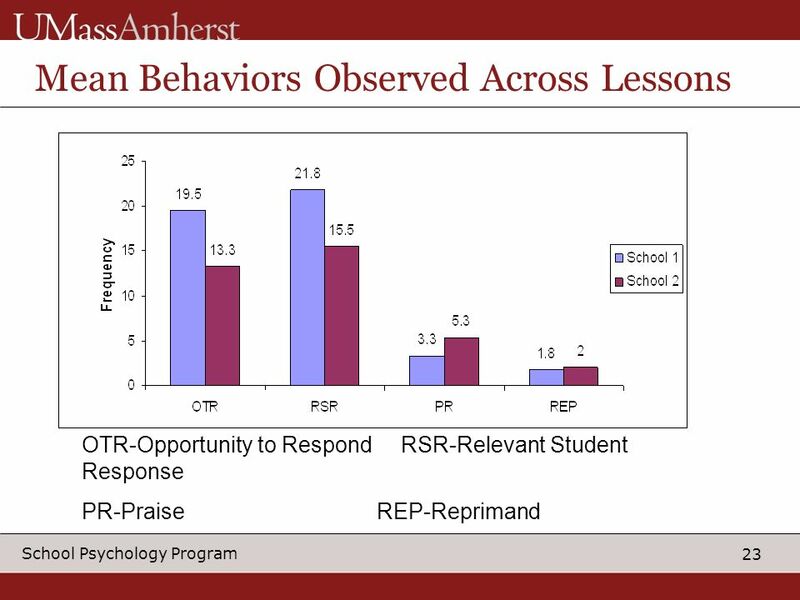 Many children enter elementary school and do not display academic or social-emotional readiness skills. 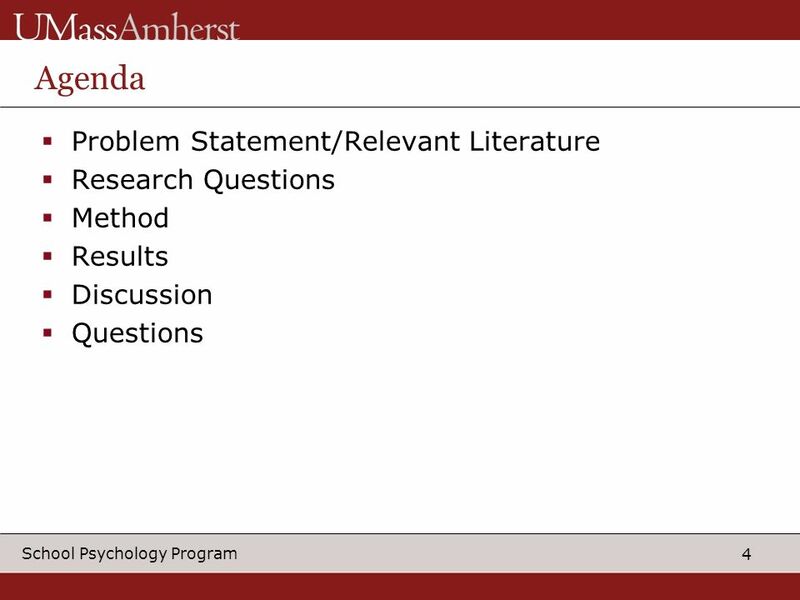 Current national mandates make it difficult to find time and resources to address issues other than academics. 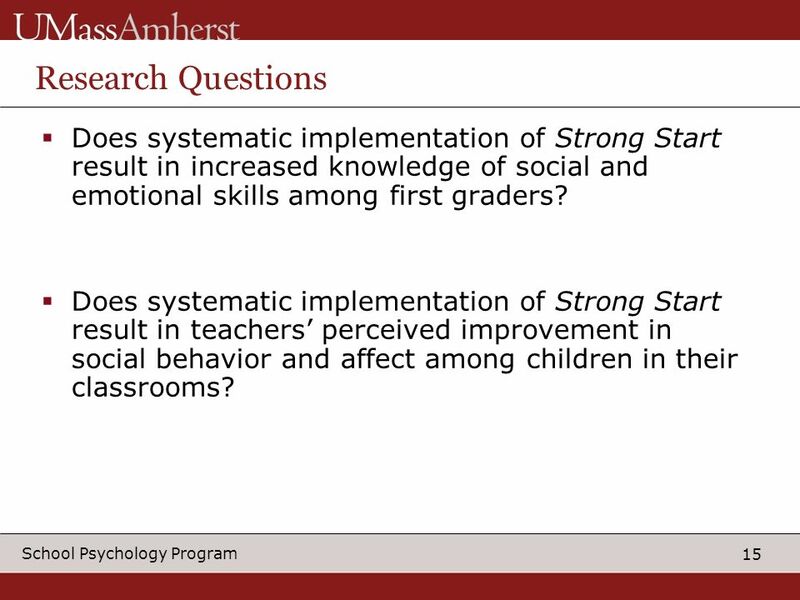 15 15 School Psychology Program Research Questions Does systematic implementation of Strong Start result in increased knowledge of social and emotional skills among first graders? 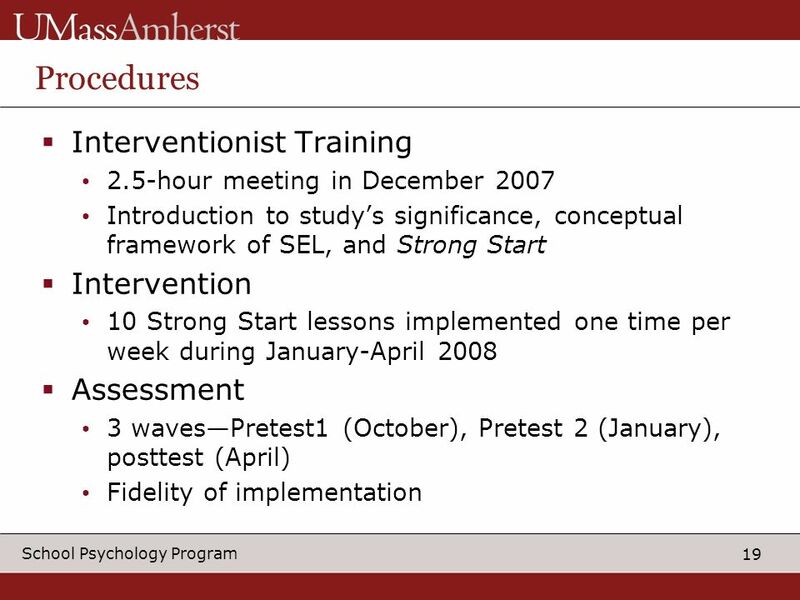 Does systematic implementation of Strong Start result in teachers perceived improvement in social behavior and affect among children in their classrooms? 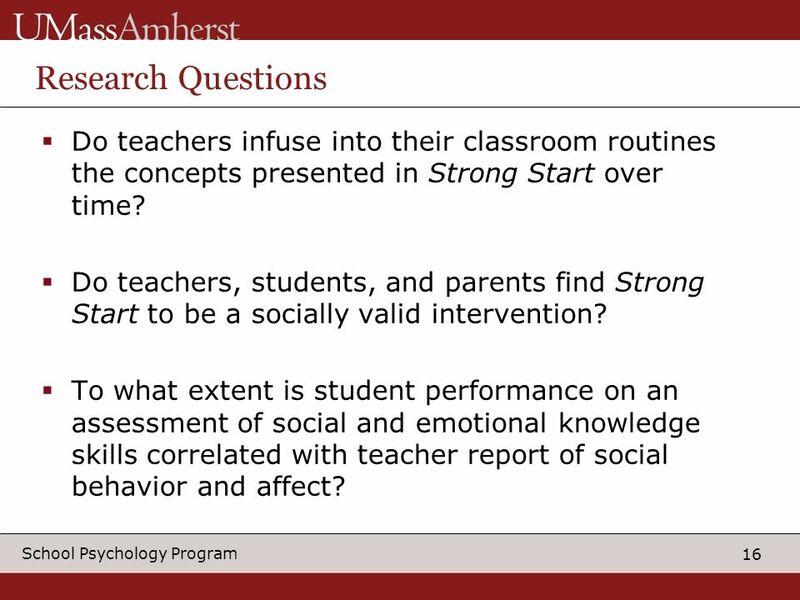 16 16 School Psychology Program Research Questions Do teachers infuse into their classroom routines the concepts presented in Strong Start over time? 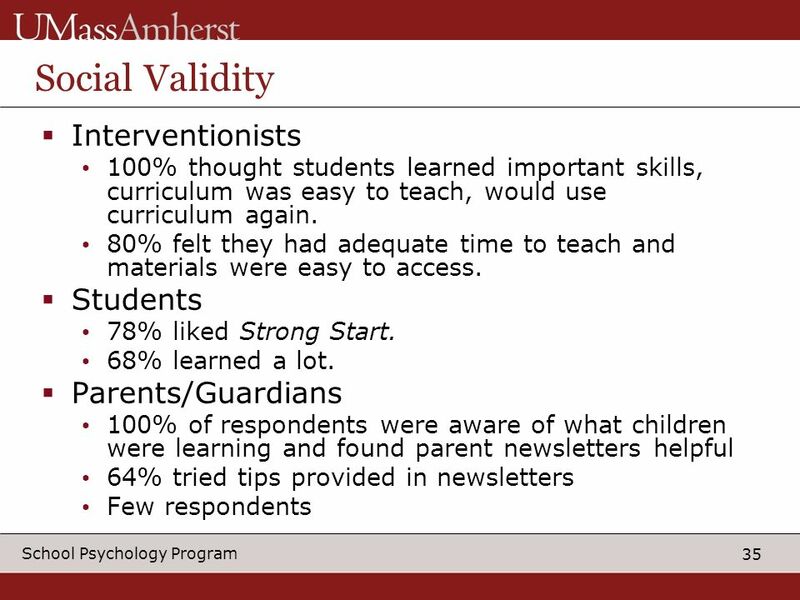 Do teachers, students, and parents find Strong Start to be a socially valid intervention? 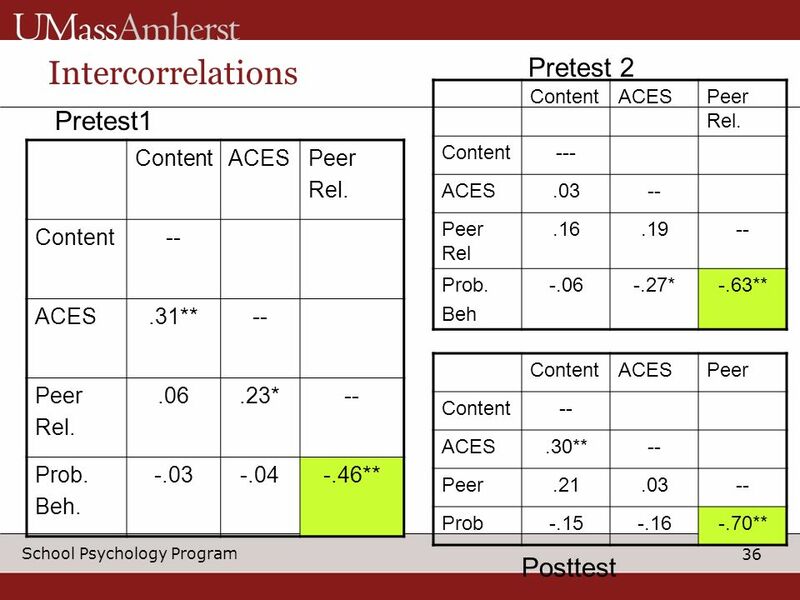 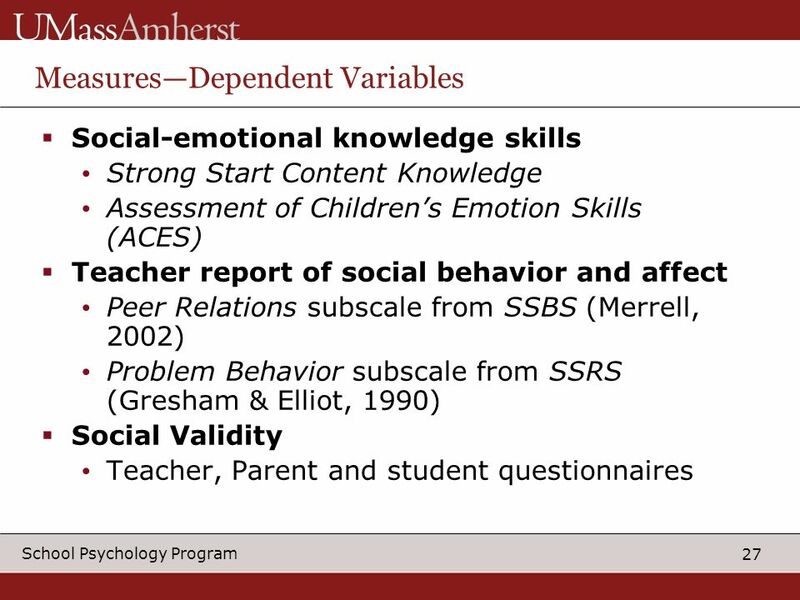 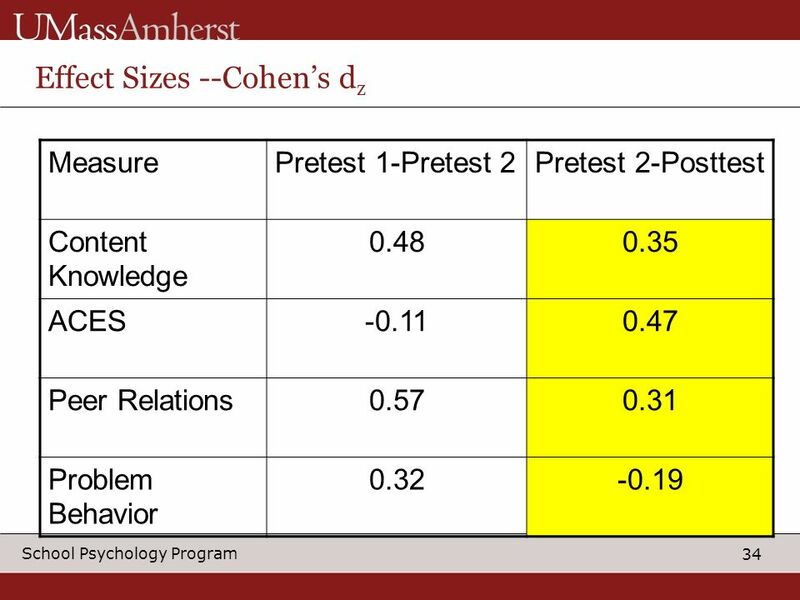 To what extent is student performance on an assessment of social and emotional knowledge skills correlated with teacher report of social behavior and affect? 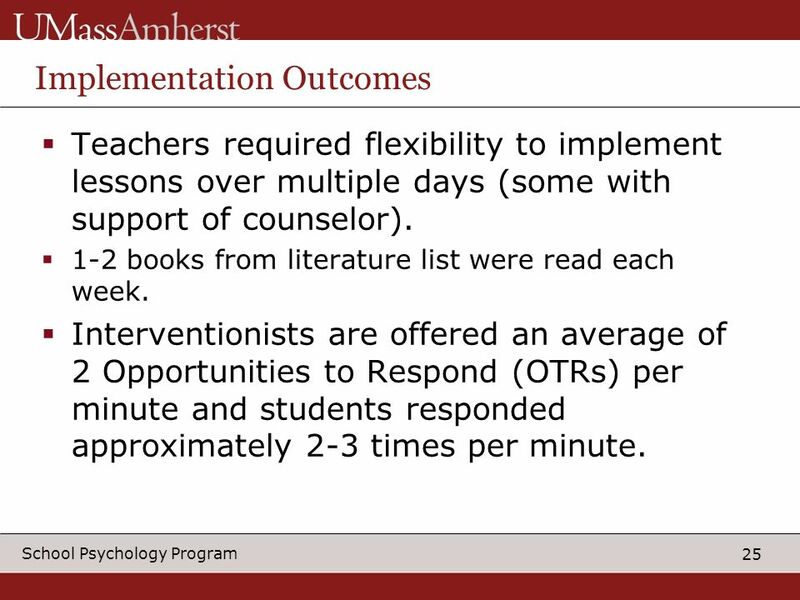 25 25 School Psychology Program Implementation Outcomes Teachers required flexibility to implement lessons over multiple days (some with support of counselor). 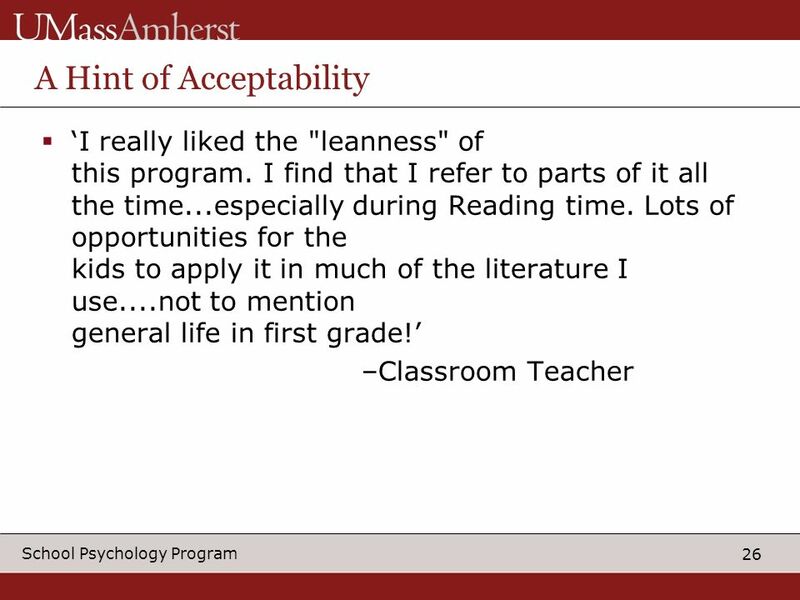 1-2 books from literature list were read each week. 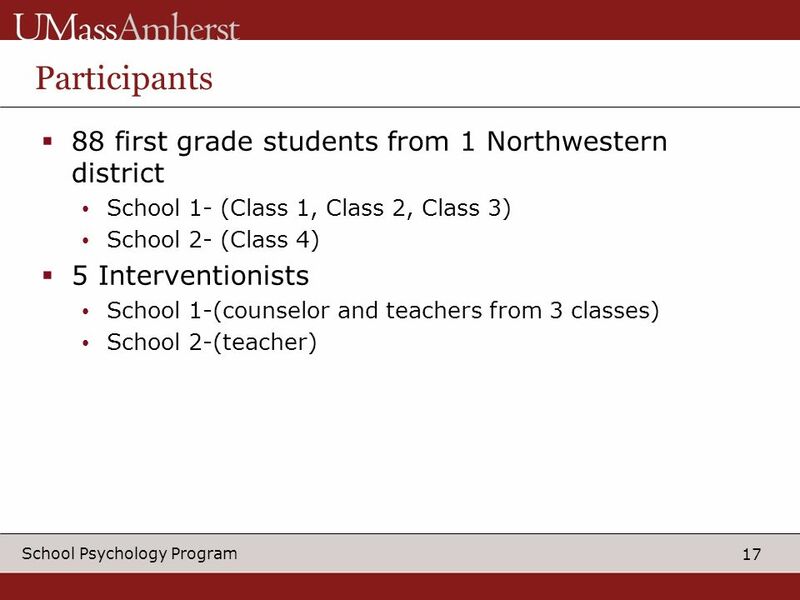 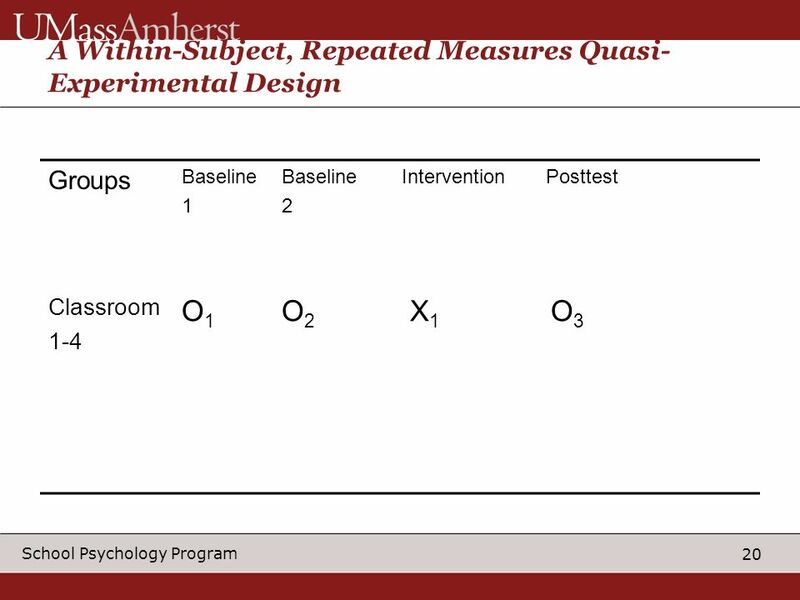 Interventionists are offered an average of 2 Opportunities to Respond (OTRs) per minute and students responded approximately 2-3 times per minute. 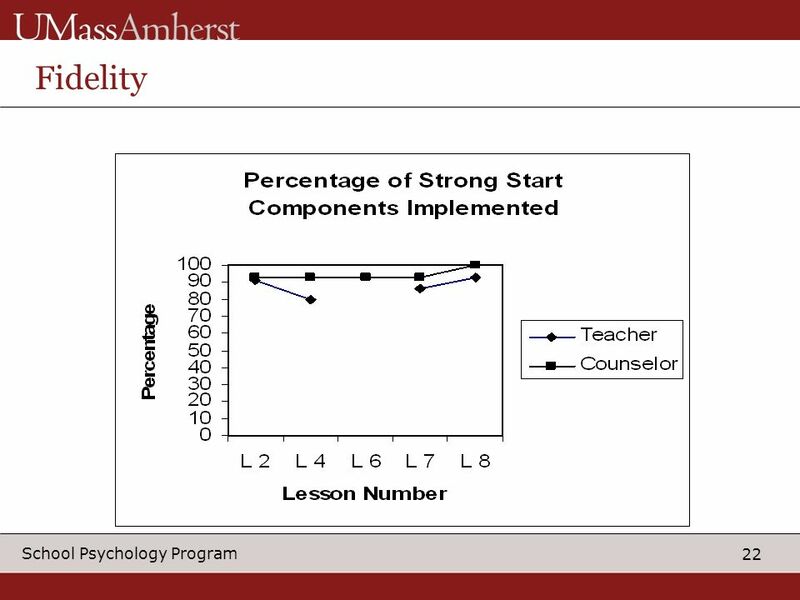 37 37 School Psychology Program Discussion Lesson components implemented with fidelity. 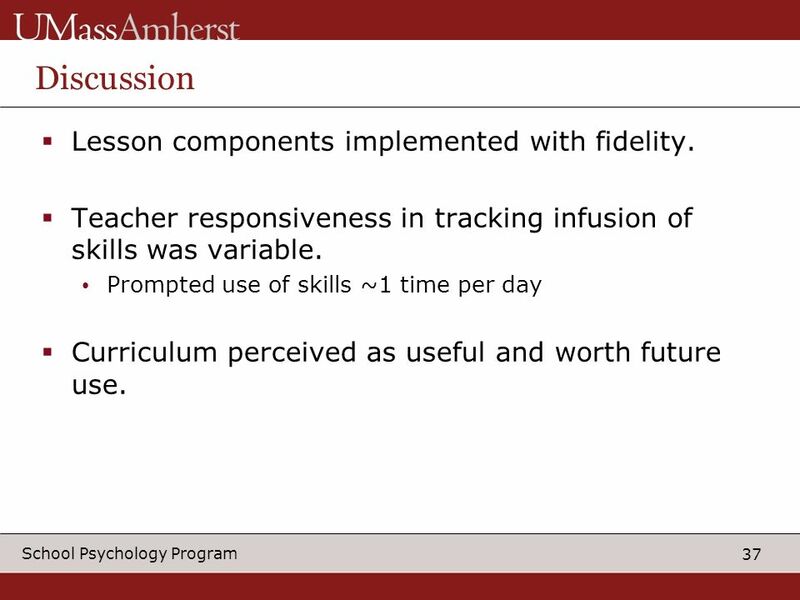 Teacher responsiveness in tracking infusion of skills was variable. 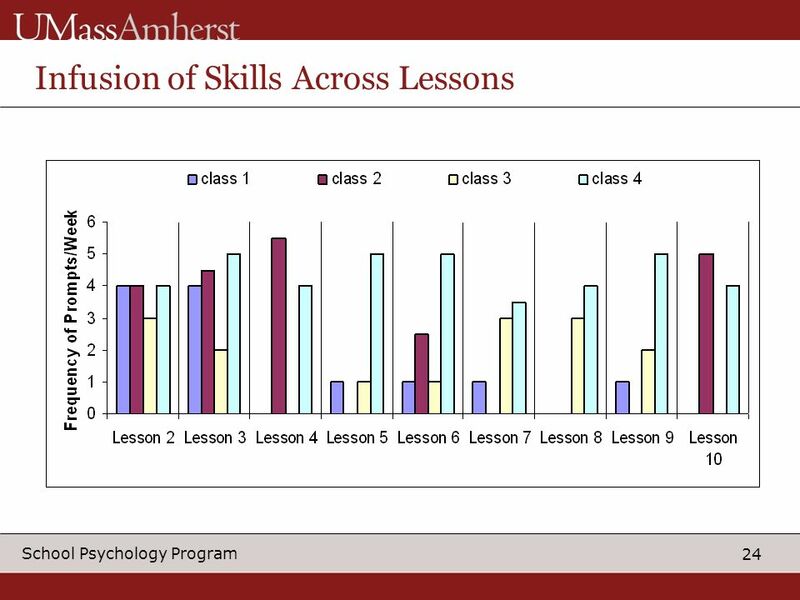 Prompted use of skills ~1 time per day Curriculum perceived as useful and worth future use. 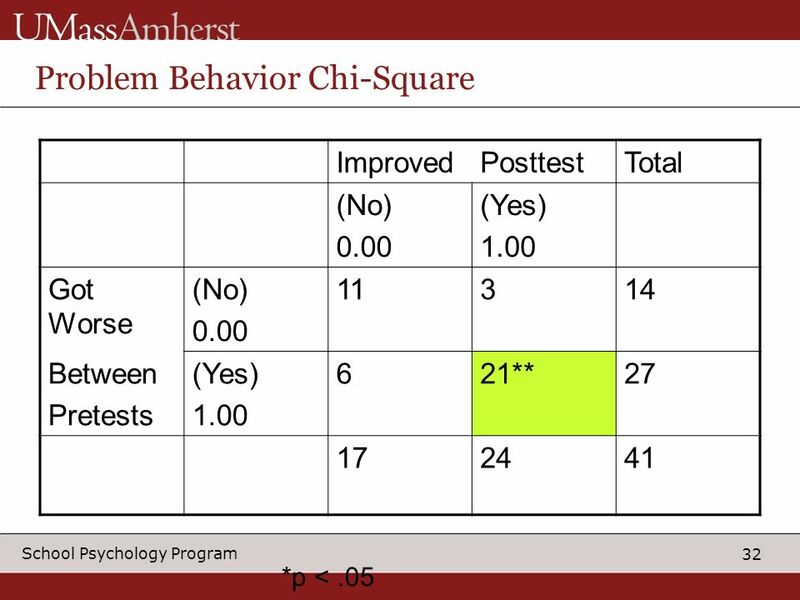 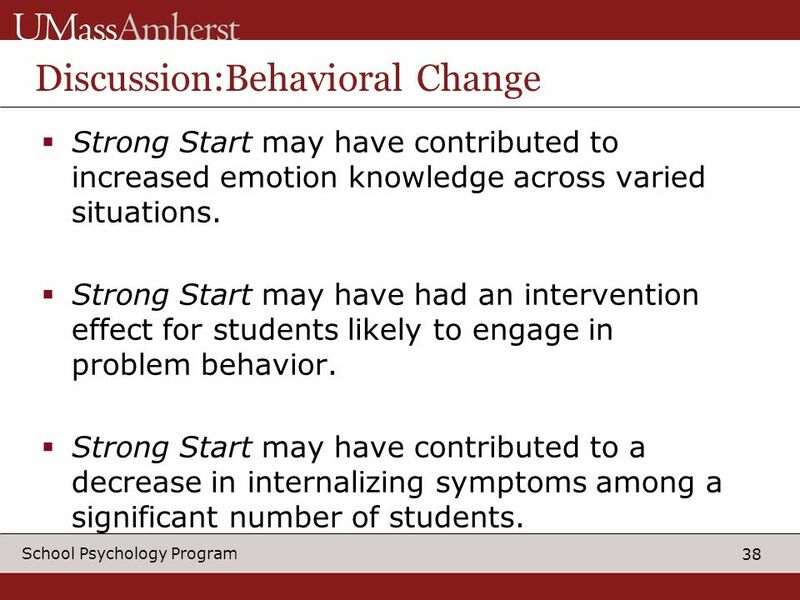 38 38 School Psychology Program Discussion:Behavioral Change Strong Start may have contributed to increased emotion knowledge across varied situations. 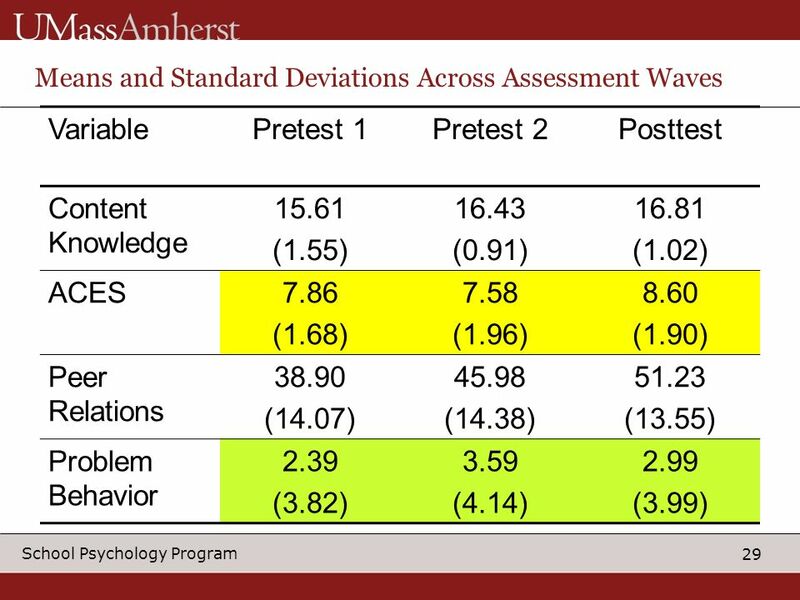 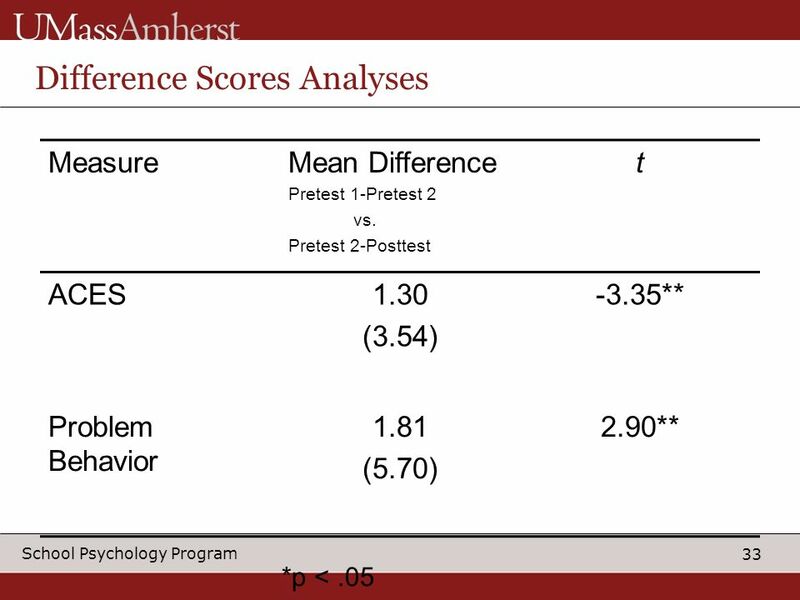 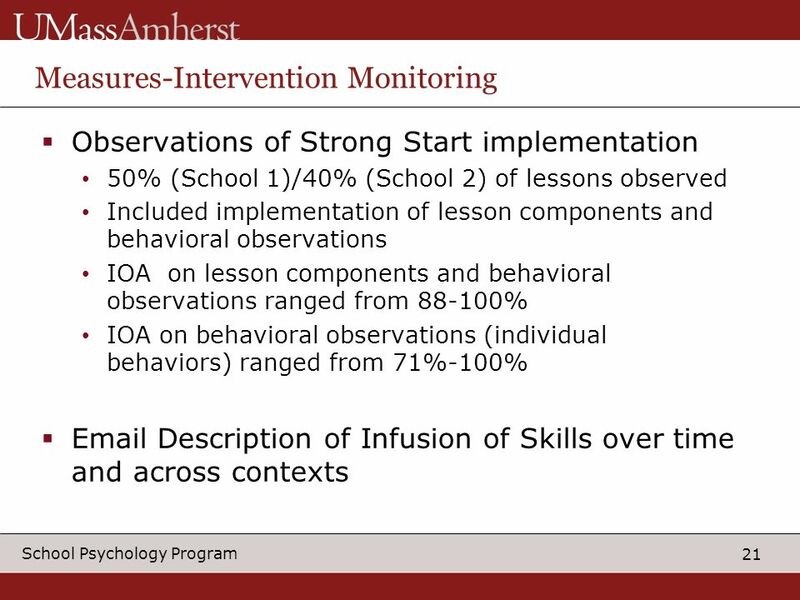 Strong Start may have had an intervention effect for students likely to engage in problem behavior. 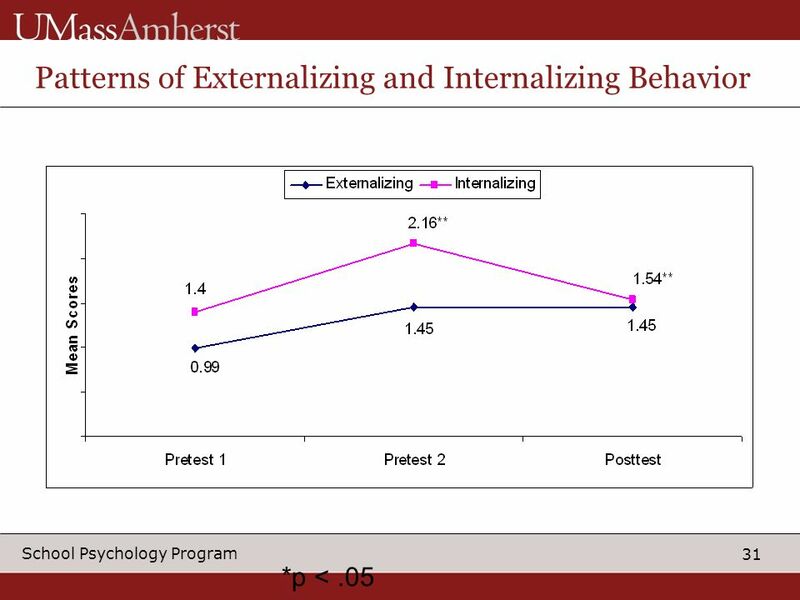 Strong Start may have contributed to a decrease in internalizing symptoms among a significant number of students. 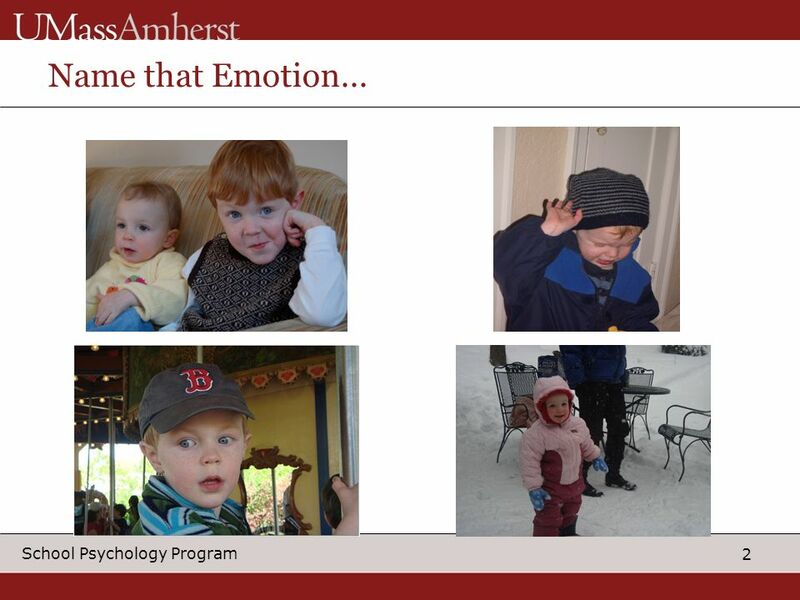 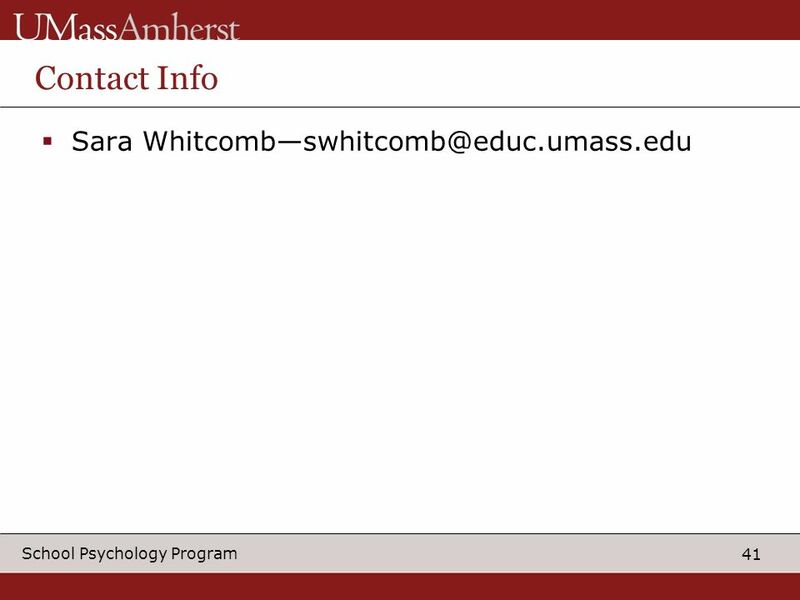 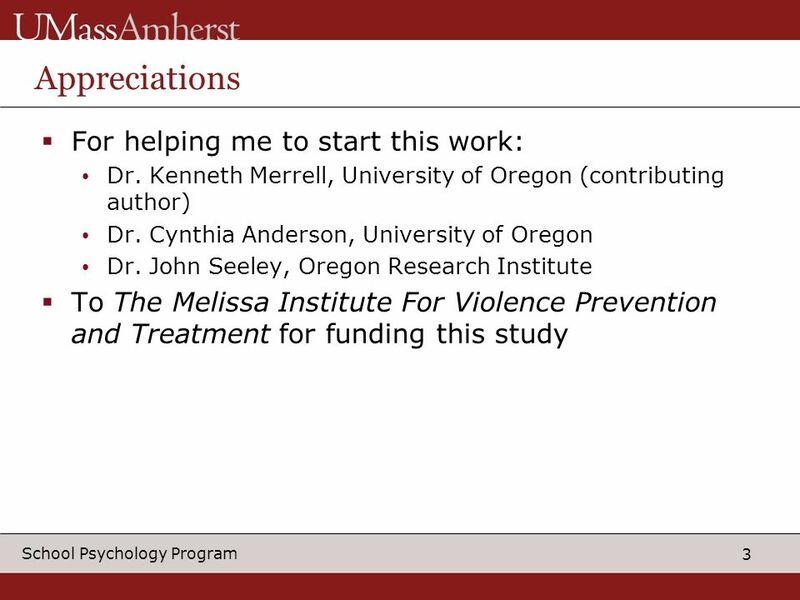 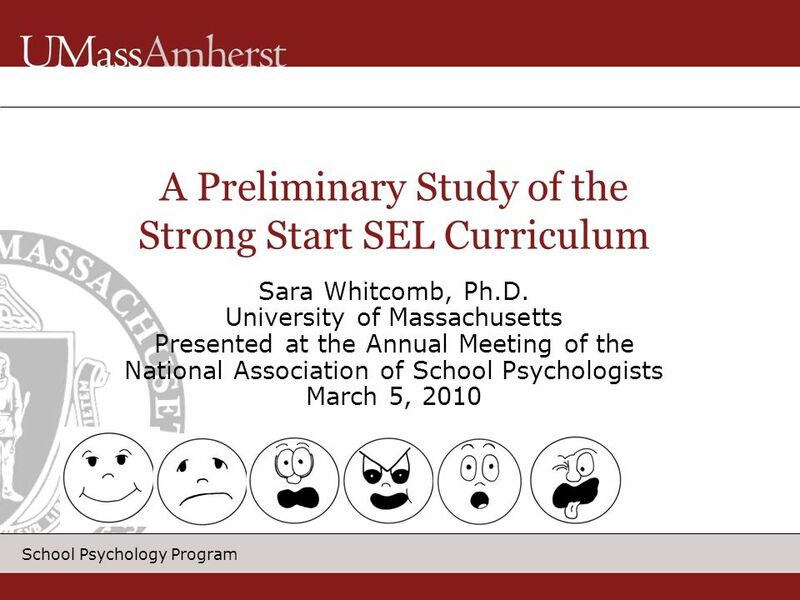 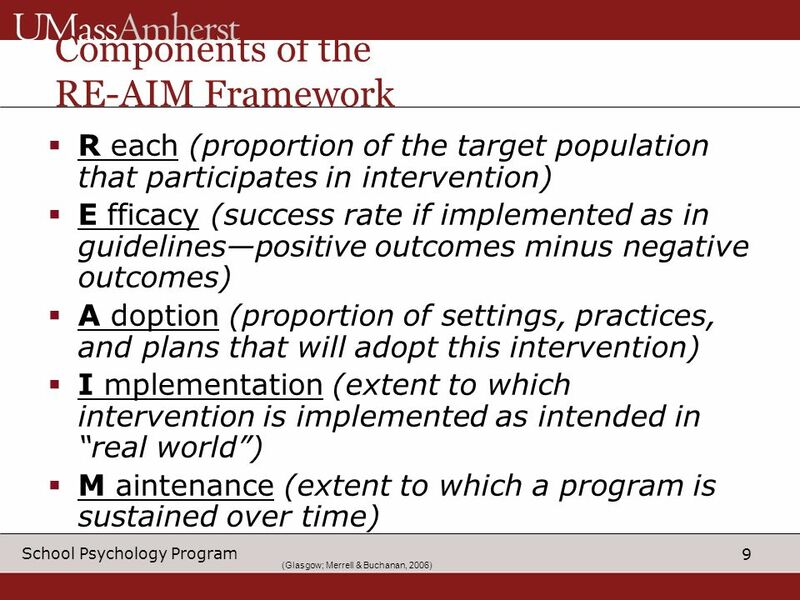 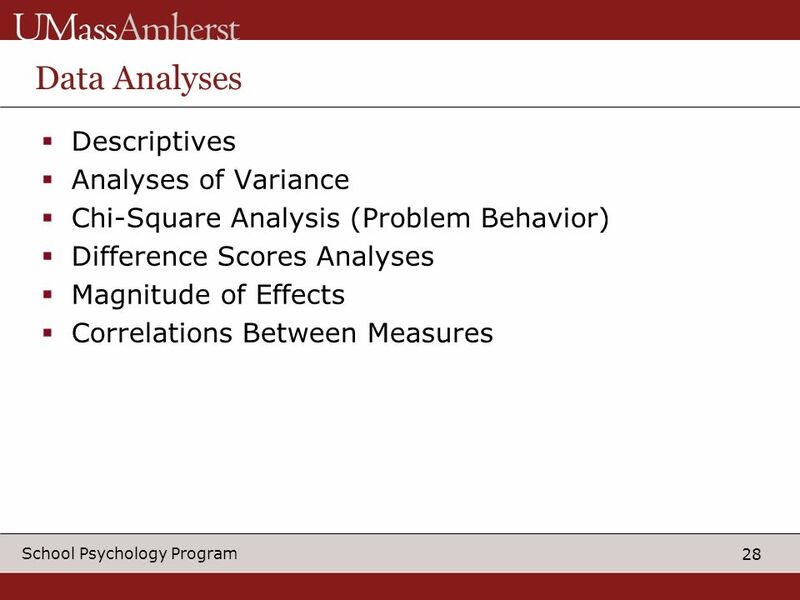 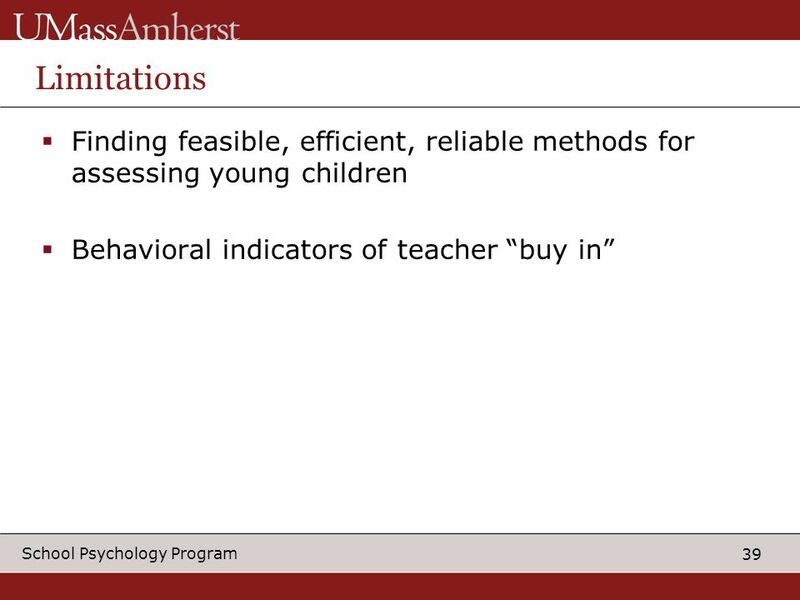 Download ppt "School Psychology Program A Preliminary Study of the Strong Start SEL Curriculum Sara Whitcomb, Ph.D. University of Massachusetts Presented at the Annual." 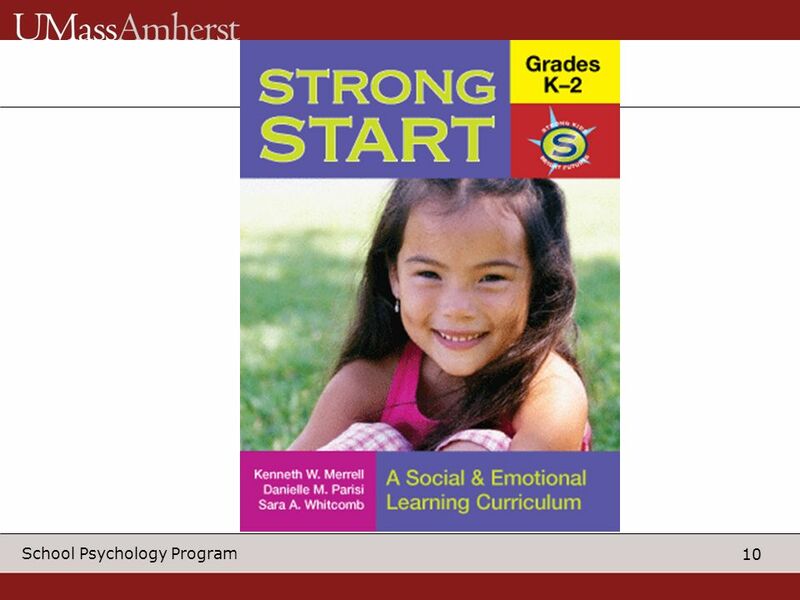 1 Yell / The Law and Special Education, Second Edition Copyright © 2006 by Pearson Education, Inc. All rights reserved. 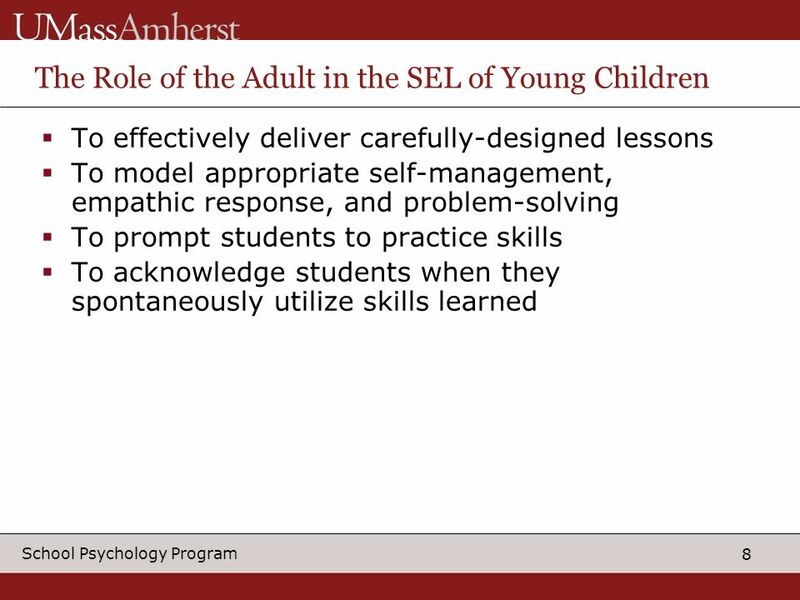 The Power of Play in an Early Childhood RtI Model Lori Zito & Kristy Feden Papillion La Vista Schools Lisa Kelly-Vance & Brigette Ryalls University of. 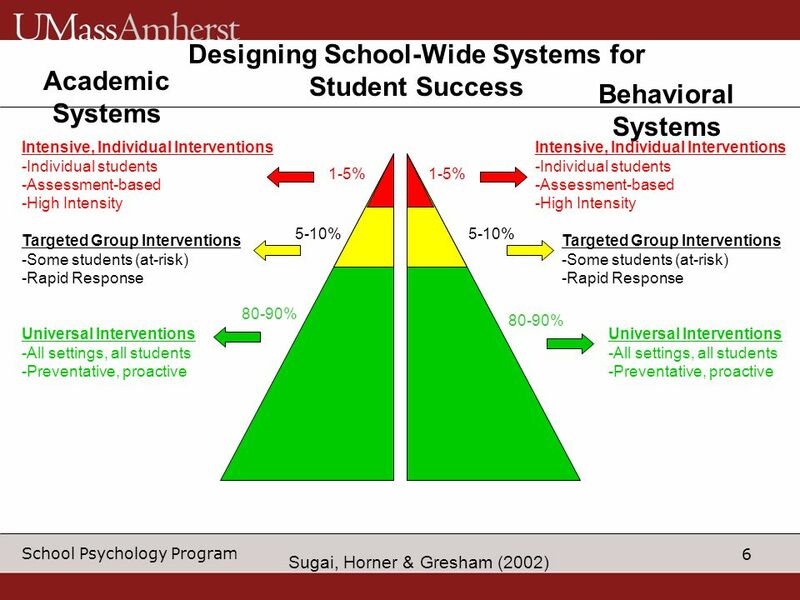 Targeted Assistance & Schoolwide Programs NCLB Technical Assistance Audio April 18, :30 PM April 19, :30 AM Alaska Department of Education.